In today's NASCAR, elimination-style Chase can be wild, crazy. But wins still matter most. 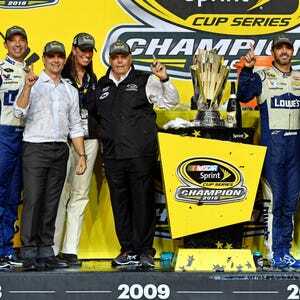 HOMESTEAD, Fla. – After all the points resets and eliminations and other crazy elements of the Chase for the Sprint Cup, guess which driver won the championship? The one with the most wins this season. Jimmie Johnson ended up with five victories this year, which was tops among all drivers. In addition, his three wins in the 10-race Chase were the most of anyone. That’s welcome news, because it makes the champion easier to accept in a format which has increased the chances of a random result. Johnson only scored the eighth-most points among all drivers this season, which used to be how NASCAR measured a champion. 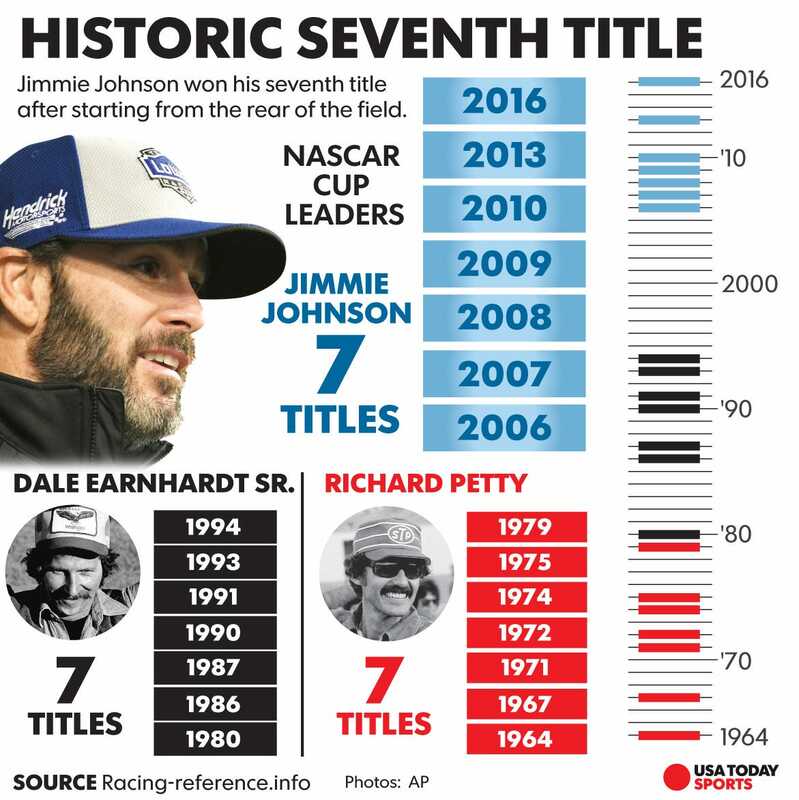 His critics will seize on stats like that to try and make an argument Johnson’s seven championships don’t equal those of Richard Petty or Dale Earnhardt Sr., who have the same number. But in today’s NASCAR, winning is more important than consistency -- and the old days aren’t coming back. Just look at Kyle Busch, who won the championship last season but had an even better Chase this year. Busch’s average finish in the 2015 Chase was 9.8; this year, he improved it to 7.2. That bested Johnson’s 10.6 average finish in the playoff -- which was good enough to win a title. The early part of this Chase format has turned into an exercise in avoiding disaster or bad finishes. Then, if a driver can do that, it’s about wins – and when you get them. Johnson won a race in each of the final three rounds, which allowed him to overcome results like a 23rd-place finish at Talladega Superspeedway and a 38th-place finish at Phoenix International Raceway. That’s not something fans were used to seeing in the original Chase design, which rewarded the best driver over the final 10 races. So what to make of all this? In Year 3 of the new Chase, it’s clear the one-race playoff at Homestead-Miami Speedway has generated enough excitement to make it stick around. NASCAR hates the idea of the championship being decided before the final race, so this is the format that will remain. Fans who aren’t comfortable with it have to adjust their thinking should they choose to keep following the sport. Fortunately, each of the three Cup champions so far in this format have felt worthy – even if they lack the traditional credentials (Busch didn’t run a full season, for example). That’s a good thing for the playoff's credibility, but NASCAR's luck can't last forever. Eventually, the one-race playoff is going to produce a result fans might have trouble accepting. If there are strange circumstances in the final race or a winner who feels like a fluke, the discussion about the Chase might change. For now, NASCAR has made it clear the format isn’t going anywhere.